Try this simple, four-ingredient glaze as an inexpensive way to add savory flavor to roast turkey. For Maple Mustard Glaze: Combine ingredients together; makes 3/4 cup. Set aside. 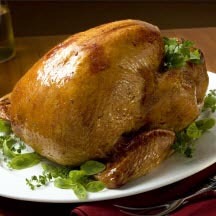 Remove neck and giblets from body and neck cavities of turkey; refrigerate for another use or discard. Drain juices from turkey; pat dry with paper towels. Season inside and out with salt and pepper, as desired. Turn wings back to hold neck skin in place Return legs to the tucked position, if untucked. Place turkey, breast side up, on flat rack in shallow roasting pan. Roast turkey 2 hours*. Brush with 1/4 cup of the glaze. Loosely cover breast and tops of drumsticks with aluminum foil to prevent breast from overcooking and glaze from darkening too much. Brush with additional 1/4 cup of the glaze after 30 minutes. Continue roasting turkey about 1 hour, or until meat thermometer reaches 180°F (85°C) when inserted in thickest part of thigh. Remove turkey from oven. Brush with remaining glaze.